Copyright: © 2017 Dar RA, et al. This is an open-access article distributed under the terms of the Creative Commons Attribution License, which permits unrestricted use, distribution, and reproduction in any medium, provided the original author and source are credited. During the summer 2014, dark black symptoms beneath the leaf surfaces were observed on the Populas alba L species in the south Kashmir. In the later stages of development the infection subtends the whole surface resulting in leaf collapse. Fungal isolates were recovered directly from the structures present on the lesions. Purified DNA from each isolate was amplified using the random amplified polymorphic DNA technique recruiting the ITSI (TCCGTAGGTGAACCTGCGG) and ITS4 (TCCTCCGC TTATTGATATGC) specific primers. Amplification products visualized on agarose gel showed specific band pattern for each isolate. The mycotaxonomic characterization and phylogenetic interpretations showed the emergence of fungal species, Meliola sp. KY623717 with genetic variance of 2% in internal transcribed spacer (ITS) region of rDNA from closely related species under geographically distinct region. Black colony forming parasitic fungi are known as “Black or dark mildews”. The Meliola sp are obligate bio trophic parasites found superficially on the aerial portions of vascular plants commonly known as black or dark mildews . These are ectoparasites producing black colonies on the surface of the host plants. The black colony forming parasitic fungi belong to several taxonomic groups, viz. Hyphomycetes, Meliolales, Schiffnerula and its anamorphic forms, Asterinales, Meliolinaceae, etc. Of these, the fungi belonging to Meliolales can be distinguished by their two celled appressoriate mycelium, setae, presence of globose perithecia with setae, appendages etc. These are the unique group of fungi which are distinguished very easily. 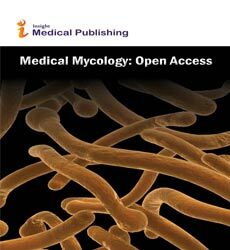 This work gives a clue to the identification of the meliolaceous fungi at a glance based on the morphological as well as molecular data. Dry mycelium mat (50 mg) was transferred in a sterile eppendorf tube. It was crushed with sterile scissor and made fine powder. CTAB extraction buffer (600 μl) pre warmed at 60°C was also added . The resulted mycelial powder was incubated in a water bath at 50°C for 3-4 h with vortexing at the interval of 10 min. The resulting samples were centrifuged at 10,000 rpm for 20 min at room temperature. The supernatant was transferred to sterile eppendorf tube. Chloroform (600 μl) and isoamyl alcohol (in 24:1 ratio) were added and subjected to vortexing again for 5 min. Sodium acetate (0.5 μl, 3 M, pH 5.2) was added further and mixed gently and stored in ice for 15 min. The solution was again centrifuged at 16,000 rpm at 4°C for 10 min. Chilled isopropanol (600 μl) was added to eppendorf tube and stored at -50°C for 10 min. The supernatant was decanted and 600 μl ethanol (70%) was added and solution was kept at room temperature. The overnight pellet was dried. Distilled water (25 μl) was added and kept for 2 h at room temperatures followed by electrophoresis. The DNA samples were stored at -20°C. Universal primers ITSI (TCCGTAGGTGAACCTGCGG) and ITS4 (TCCTCCGC TTATTGATATGC)  were used to amplify the ITS regions between the small (18S gene) and large (28S gene) nuclear rDNA, including the 5.8S rDNA. Amplifications were carried out in a 50 μl volume, containing 10 mM Tris-HCl pH 8.3, 50 mM KCl, 1.1 mM MgCl2 and 0.01% gelatin, 200 M of each dNTP (Promega), 1.0 M of each primer, 1.0 U of Taq DNA polymerase (Sigma) and 30-50 ng of DNA. Amplicons were visualised on 1.5% agarose gel under the UV trans-illuminator (Figure 1). Cycling parameters were 5 min at 94°C; 30 cycles of 1 min at 94°C, 1 min 30 s at 50°C, 1 min 30 s at 72°C; with a final extension at 72°C for 7 min. Aliquots of about 35 ng of DNA were purified from agarose gel with a Qiaex II Kit (Qiagen, Hilden, Germany) and automatically sequenced with an ABI Prism 3100 DNA Sequencer (Applied Biosystems, Norwalk, CT, USA). 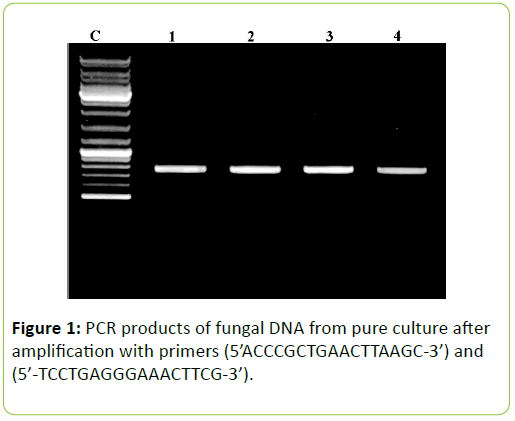 Figure 1: PCR products of fungal DNA from pure culture after amplification with primers (5’ACCCGCTGAACTTAAGC-3’) and (5’-TCCTGAGGGAAACTTCG-3’). Dark black symptoms on beneath the leaf surfaces were observed on the Populas alba in the south Kashmir. In the later stages of development the infection subtends the whole surface which results in the leaf collapsing (Figure 2). Minute amphigenous black colonies mostly epiphyllous, initially scattered but becoming confluent with age, dense, 1-6 mm diameter. Hyphae dark brown, septate, straight to sub-straight bearing appressoria. Perithecia brown, globose, scattered, black, 102-127 μm diameter . Ascospores hyaline inside the ascus, becoming grey or brown with age, dark brown or grey at maturity, cylindrical to ellipsoid, rounded at the tips, 4-septate, constricted at the septa. 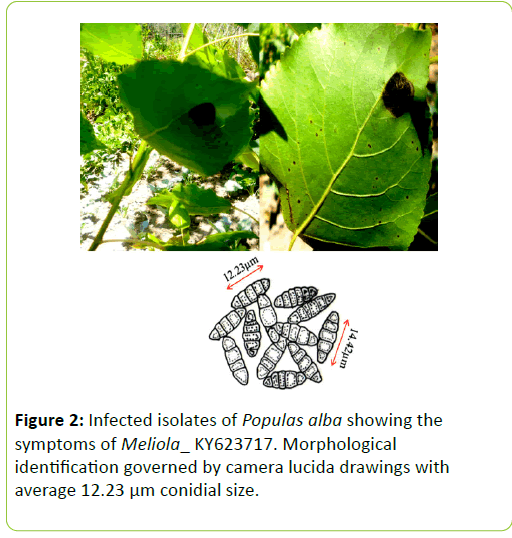 Figure 2: Infected isolates of Populas alba showing the symptoms of Meliola_ KY623717. Morphological identification governed by camera lucida drawings with average 12.23 μm conidial size. PCR products analyzed on 2% agarose electrophoresis gel. Primers (5’-ACCCGCTGAACTTAAGC-3’) and (‘5- TCCTGAGGGAAACTTCG-3’) were used to amplify the partial ITS regions. For phylogenetic analysis, ITS rDNA sequences from additional species were retrieved from GenBank. The phylogenetic tree based on concatenated ITS regions of rDNA strict consensus sequences of the Meliola mangiferae_ KY623717 and other fungal lineages used as out groups [5,6]. Consensus regions were compared against GenBank database using Mega BLAST program. 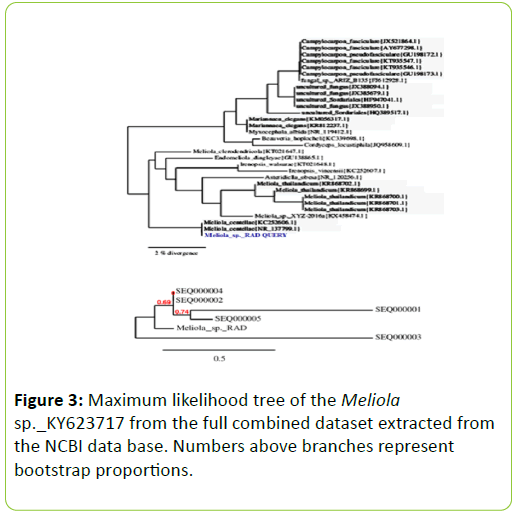 The closest hit sequences and representatives of selected Meliola species were obtained from GenBank to help clarify the phylogenetic relationship of Meliolales within the class. All sequences were downloaded in FASTA format and aligned using the multiple sequence alignment program MUSCLE built in PHYML (Phylogenetic Inferences using Maximum Likelihood). Alignments were checked and necessary manual adjustments were made. All ambiguously aligned regions within dataset were excluded from the analysis. Gaps (insertions/deletions) were treated as missing data. Branches with <30% bootstrap support collapsed to polytomies and a long branch shortened by 50%. Terminal nodes marked strict consensus sequences with the accession numbers listed in supporting GenBank data base. The scale bar indicates the number of substitutions per site. In interpreting the tree it was found that Meliola mangiferae_ KY623717 has diverged from closely related Meliola centellae (KC252606.1) and Meliola centellae (NR_137799.1) by 2%. Figure 3: Maximum likelihood tree of the Meliola sp._KY623717 from the full combined dataset extracted from the NCBI data base. Numbers above branches represent bootstrap proportions. The authors declare that no conflicts of interest exist for publication of this manuscript. Carlier G, LoRand JP, Bonhomme M, Carlotto V (1996) A reappraisal of the Cenozoic Inner Arc magmatism in southern Peru: Consequences for the evolution of the Central Andes for the past 50 Ma. Third ISAG St Malo 1: 551-554. Schoch CL, Seifert KA, Huhndorf S, Robert V, Spouge JL, et al. (2012) Nuclear ribosomal internal transcribed spacer (ITS) region as a universal DNA barcode marker for Fungi. Proc of the Natl Acad Sci U S A 109: 6241-6246. White TJ, Bruns T, Lee SJ, Taylor JL (1990) Amplification and direct sequencing of fungal ribosomal RNA genes for phylogenetics. PCR protocols 18: 315-322. Crous PW, Lennox CL, Sutton BC (1995) Selenophoma eucalypti and Stigmina robbenensis spp. nov. from Eucalyptus leaves on Robben Island. Mycol research 1: 648-652. Dar RA, Rai AN, Shiekh IA (2017) First report of white stain of apple caused by Trichothecium kashmeriana in India. Archives Phytopatho & Plant Prote 50: 99-108. Dar RA, Rai AN, Shiekh IA (2017) Stigmina carpophila detected on Prunus armeniaca and Prunus persica in India. Australa Plant Dise Notes 12: 19.